Beautiful Double Flower Design in this Bracelet Created by Master Silversmith Navajo Artist Artie Yellowhorse. Signed by the artist. The bracelet is 42 grams of 925 Sterling Silver. 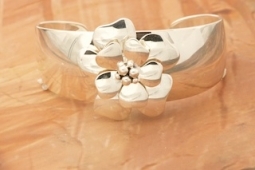 The sterling silver flower has a 1 1/4" diameter.